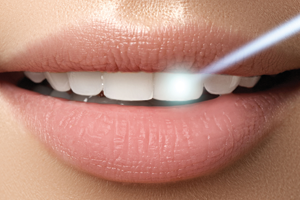 What is Laser Dentistry and How Does It Help? Laser dentistry allows dentists to focus on extremely specific areas without affecting surrounding tissue. It allows dentists to avoid using a drill or anesthesia in some situations. Lasers reduce discomfort and healing time. Here are some common laser dentistry procedures and the safety information you need to decide if they’re right for you. Laser dentistry works on the same principles as other laser procedures such as vision correction. A small, intensely focused beam of light can pinpoint a very precise area for treatment. What Types of Procedures Use Laser? Tooth Decay – Before you have a filling, dentists usually use a drill to remove the part of your tooth that is decayed. Then they add your filling. Now dentists can use laser instead of a drill to remove unwanted material. Tissue Removal – If you have canker sores, small lesions, or an area that may need to be biopsied for mouth cancer, dentists can use laser to remove the tissue. Gum Disease – If you have a root canal or gum disease, your dentist can use a laser to remove areas of bacterial infection and reshape your gums. Tooth Whitening – After your dentist applies whitening solutions to your teeth, he or she may use a laser’s heat to activate and speed up the process for whiter teeth in less time. Many patients who are nervous about the dentist’s drill say laser dentistry changes everything. In many situations, tooth decay can be comfortably removed without any drilling or anesthesia. There are other benefits as well. There is less bleeding and swelling during procedures. In cavity treatment, the precision of the laser may make it possible to leave more healthy tooth when decayed areas are removed. Laser sterilizes the area it treats, so there are fewer bacterial infections after treatment. Laser procedures often reduce pain after a procedure and result in a shorter healing period. Dental lasers have been used safely since 1994. They are as safe as traditional dental treatments. Cobblestone Park Family Dental has experts trained in using laser therapy to shorten your recovery, improve your healing time, and make your dental visit more comfortable. Contact us today to find out if laser dentistry is right for you.